Dr. Dan Sperling, M.D., D.A.B.R. Dr. Dan Sperling is a leader in the detection of prostate tumors through the use of image-guided technology. Dr. Sperling developed the 3T Multi-Parametric MRI – BlueLaser™ solutions. He specializes in Magnetic Resonance Imaging (MRI) which he uses for tumor detection, targeted biopsies (MRI-Guided Biopsy; prostate mapping, and treatment). 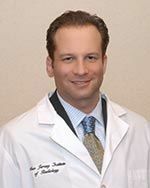 Dr. Sperling serves as Medical Director and Chief of Interventional Uroradiology at the Sperling Prostate Center in Florida and New York, as well as the Medical Director of its parent practice, the Sperling Medical Group. Dr. Sperling is a member of the American Board of Radiology and licensed in Massachusetts, Florida, Maryland, New York and New Jersey. Additionally, he is certified by the Society of Uroradiology, American Society of Laser Medicine and is an American Board of Radiology Diplomate. He completed a fellowship in oncologic PET/CT and interventional body imaging at the Albert Einstein College of Medicine at Montefiore Medical Center in New York. He completed a second fellowship in nuclear radiology at the New York University School of Medicine at Northshore University Hospital. Dr. Sperling speaks nationally about prostate cancer detection and treatment. Most recently Dr. Sperling lectured to over 150 urologists at NYU Medical Center at the conference for Advances in Prostate Imaging and Focal Ablative Treatment of Prostate Cancer. Dr. Sperling talks about prostate cancer detection, diagnosis, and treatment. Dr. Sperling uses a high definition, multi-parametric MRI to produce detailed images of the prostate. His MRI technology provides precise images that detail the size and dimensions of the gland, allowing him to map the prostate with superior accuracy. In addition, Dr. Sperling performs several tests during the MRI to identify potential tumors and to mark these regions of interest. The results display the size and location of possible tumors in unprecedented detail. Any suspected tumors can be targeted and sampled through either MRI-Guided Biopsy or MRI/Ultrasound Fusion Biopsy. By combining the biopsy results with the prostate map, Dr. Sperling can help patients and doctors improve cancer detection and treatment planning, whether the treatment of choice is surgery, radiation or ablation, watchful waiting or focal therapy. Dr. Sperling offers several methods to treat prostate tumors, including MRI-Guided Prostate Laser Ablation, a procedure he helped to pioneer. This revolutionary treatment represents a major shift from radical surgery and radiation. MRI-Guided prostate Laser Ablation is a minimally invasive procedure that can virtually eliminate many of the risks associated with traditional forms of prostate treatment, such as impotence (erectile dysfunction) and incontinence (loss of bladder control). MRI-Guided Laser Ablation requires no inpatient surgery and is performed by Dr. Sperling in less than an hour.